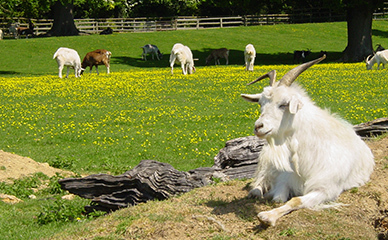 Buttercups Sanctuary for Goats was established by Robert Hitch in 1989 when he took in just two goats from the RSPCA. Before long goats who had been suffering from cruelty, neglect and starvation, or simply abandoned by the roadside or no longer wanted, began arriving in such numbers that the charitable status was sought in order to secure the long term future of the Sanctuary. The Charities Commission gave this status in September 2003 and still today Buttercups is the only registered goat Charity in the United Kingdom whose sole aim is to provide relief to goats that have suffered or no longer have a home. Set in ancient parkland the Sanctuary provides animals that have suffered so much with a safe and loving home for the rest of their lives. As well as open fields to roam in, all of the animals at Buttercups have warm and dry undercover accommodation at night. At Buttercups goats that have been mistreated and abused, starved and abandoned, are taken into care, giving them an environment of love and kindness. Here their 'hurts' can be treated and their experience of cruelty is replaced with understanding and trust. 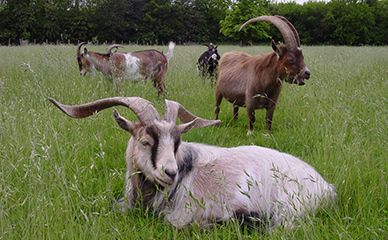 Goats arrive at the Sanctuary from all over Kent, the bordering counties and London and we ensure that each animal receives the individual attention it deserves. Buttercups Sanctuary for Goats is now home to over 140 goats and provides care to an additional 130 goats in foster homes. The charity relies entirley upon the goodwill and generosity of its supporters and friends by providing financial support through donations.